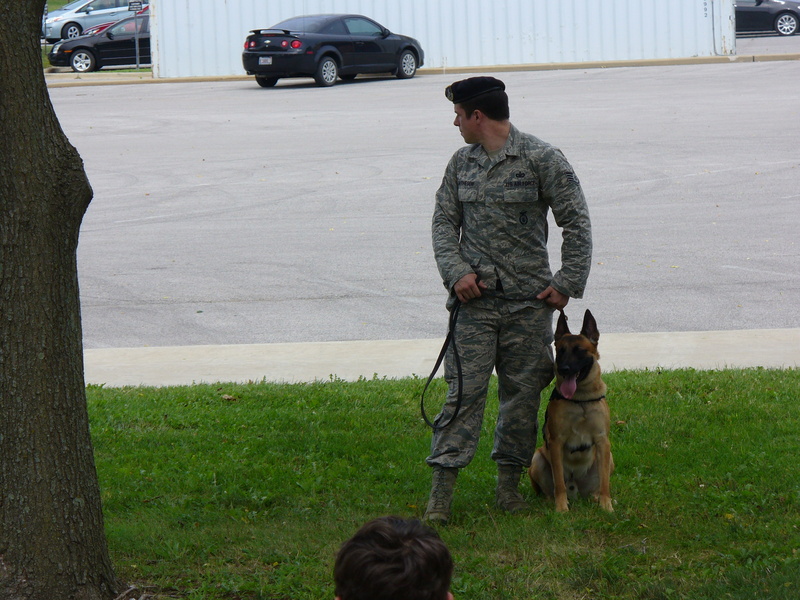 Last week I had the opportunity to watch a K-9 demonstration by some of the Scott AFB Security Force troops. They showed us some of the equipment they use and how they train their working dogs. In the photos you can see the jacket and pants worn during training, which is made from thick and strong material to protect the human from the dog’s sharp teeth. 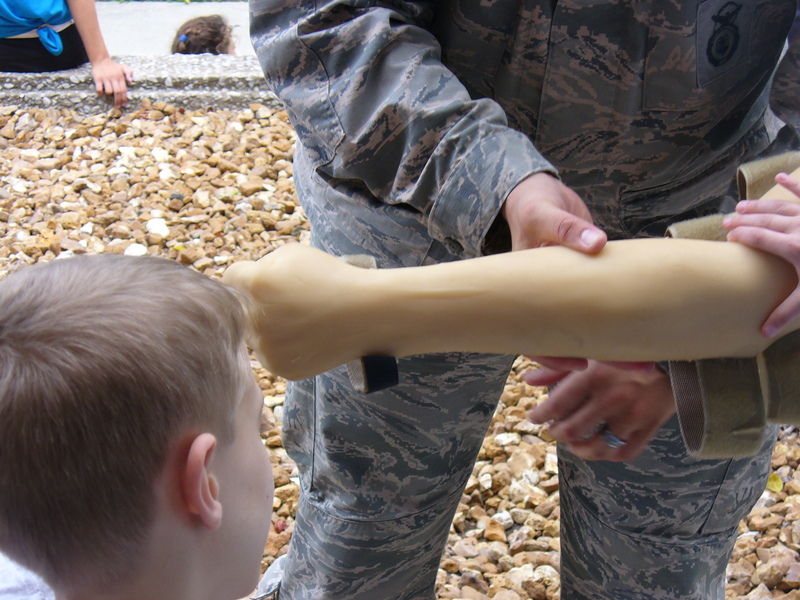 They sometimes use a fake ‘arm’ to help protect the real thing. The demo was showing us how Rromesha (Rrom for short, pronounced Rome) is trained to obey on command by either escorting an individual, attacking a possible suspect, or staying on a criminal until otherwise instructed to let go. And Rrom will not let go until he is commanded! These dogs sometimes protect the President of the United States (with their human partner), or lead troops through towns in Afghanistan or Iraq where insurgents could have IEDs and other explosives in harm’s way, or work on a military installation. The dogs are usually first trained (to sit, roll over, etc) in a private home until they are nine months old or so and then turned over to Security Forces to continue training for military use. 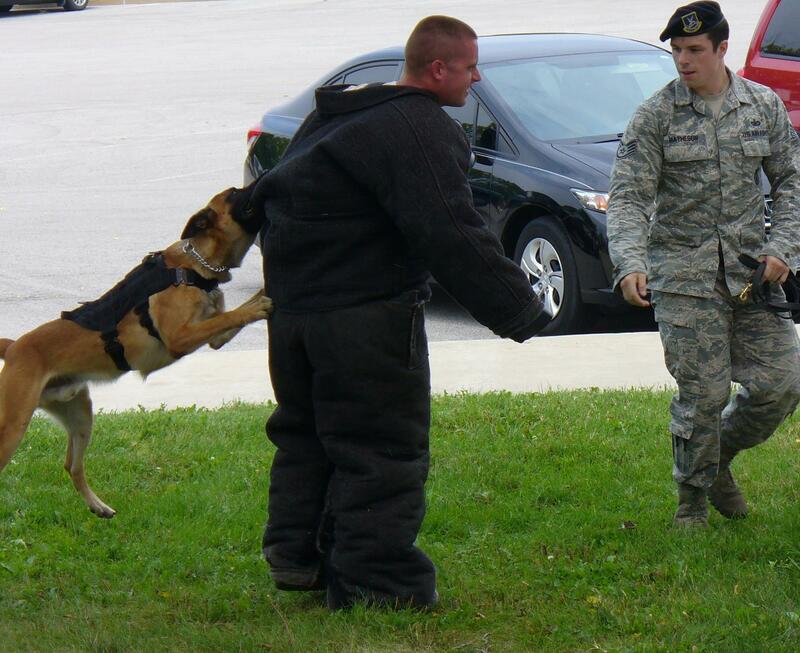 The dogs used for the military are bred in Texas specifically for this purpose. When the working dogs reach eight or nine years old, they are retired to a private home to live out the rest of their lives. When encountering a working dog on a base or in an airport, you should never walk up to it and pet it. They are trained to attack and are not good around children who they could consider a threat. Proceed with caution and get the handler’s permission first. I can imagine Kate and Spencer working with personnel in the Canine Unit. This demonstration helped me visualize some of the tasks Security Forces do and the danger some of them are in, like John who died earlier in Heir Force. I hope you enjoyed this post! Let me know if you have any questions or comments.